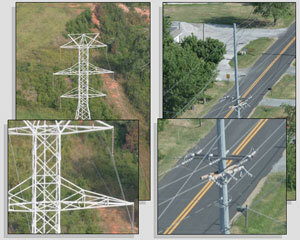 Maintenance costs are among the largest expense items in operating an electric transmission system. Detecting faulty components before they cause problems helps reduce costs and improve reliability. XP-RS uses a range of airborne remote sensing technologies to for asset inspections. Daylight, infrared and corona video cameras are used in conjunction with GPS to develop detailed reports of faulty system components. For right-of-way inspections, daylight video and high resolution structure photographs are utilized in conjunction with GPS to record natural and man-made encroachments. LiDAR can be included in the data collection system to facilitate highly accurate vegetation mapping. GIS is a logical place to integrate inspection imagery and mapping data. XP-RS can integrate its inspection products within numerous GIS applications according to its customer's specifications.